Addressing the issue of Data Governance means adopting solutions that revolve around a modern concept of Data Governance, which looks at the data as the real asset of companies, and aims for its full use in the form of shared knowledge. 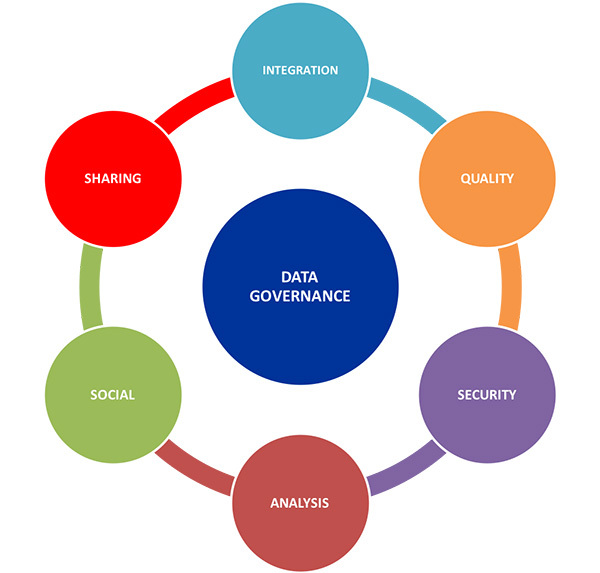 The areas of intervention of a Data Governance system are shown in the figure below; for each of them we have skills, direct experiences in the field and certifications on the main tools used. Integration is the basic process for the construction of archives to host the “knowledge” from internal and external data sources (social); its purpose being to harmonize in a single data model all the information processed within an organization whatever the origin, resolving at the same time the problems of the redundancy, consistency and homogeneity of the elementary data. Our wealth of knowledge is further enriched by significant experience in Microsoft SSIS, PENTHAO Kettle and Oracle DATA INTEGRATOR. Managing Data Quality means ensuring the best possible level of quality of corporate information assets, using a specific methodology to guarantee the result. This objective is pursued through the structured combination of processes, technologies and organizational models aimed at governing data through the application of business rules and standard controls. Identifying the critical issues and sources of possible anomalies. Checking the current status of data quality, relative to “sensitive” attributes. Quantifying the defectiveness by generating detailed and summary indicators for each type of error. Diagnosing the causes that generate anomalies and the possible resolutions. Correcting the anomalies wherever possible. Sending automatic alerts to data or process owners. The result is an overall improvement in business performance and a drastic reduction in “non-quality costs” mainly due to repetition of burdensome operating processes and, if addressed to the market, a severe loss of image. Governing the information that can be drawn from social media allows full advantage to be taken of the body of knowledge available on the internet and therefore all the information related to the concept of Big Data. We pursue this goal through the structured combination of advanced processes and technologies of semantic analysis and “machine learning”. Acquire information with respect to the real “sentiment” of customers, prospects and in any case all the “stakeholders” in the company. Identify the most important conversations and opinion leaders. Understand the positioning of your company and competitors on the market. Reduce reaction time to activate commercial and marketing strategies. Increase the effectiveness of your communication actions. Our Data Analysis strategy aims to process data in its different forms to transform it into valuable information easily usable by business functions. This objective is pursued through the structured combination of processes and technologies for the processing and analysis of data and advanced reporting, which take into account not only traditional data structures, but also all information related to the concept of Big Data. Identify “unknown patterns” that allow us to “discover” hidden information capable of enriching knowledge and developing models of predictive analysis. Make decision-making processes more effective. Increase the range of data that can be used in the analysis process, opening a window to an unlimited number of heterogeneous sources. Extend the business usability of significant business information. Expand the range of visualization devices guaranteeing access to information of interest according to an “anywhere/everywhere” model.